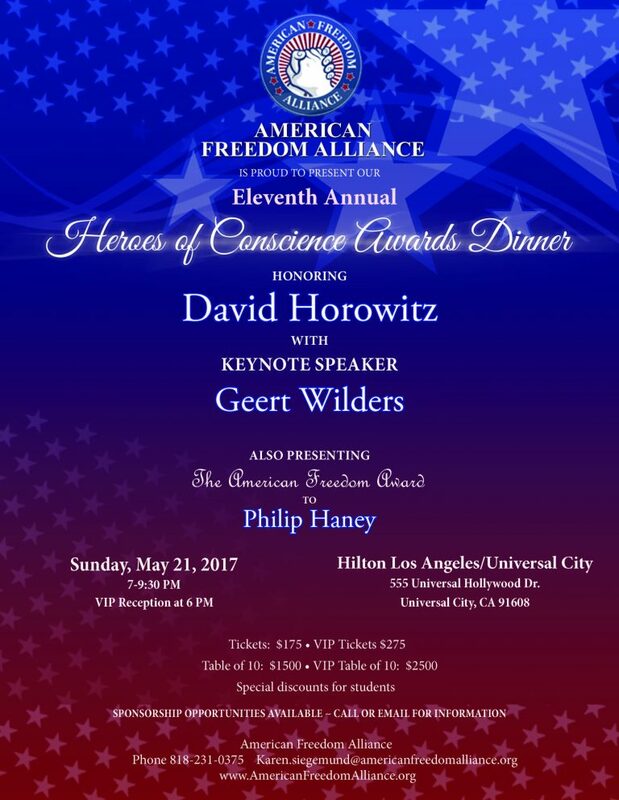 The American Freedom Alliance celebrated our Eleventh Annual Heroes of Conscience Awards Dinner last Sunday night. The award pays tribute to “heroes of conscience” – men and women who work daily to support the values and ideals which have formed the very cornerstone of our civilization. In defense of our freedoms, they have dared to venture beyond the comforts of family, career and personal commitments, taking great risks on a daily basis in order to preserve and elevate these precious gifts to humanity. Past honorees have been great men and women who have played important roles in the defense of the West, and they include Dr. Jim Enstrom and his wife Marta, filmmakers Ann McIlhenney and Phelim Macaleer, Howard and Sonja Waldow, Ed Ames, and Allen West among others. In fact, our Keynote speaker at the dinner was Geert Wilders, the Dutch Parliamentarian and leader of the Party of Freedom and 2009 honoree. 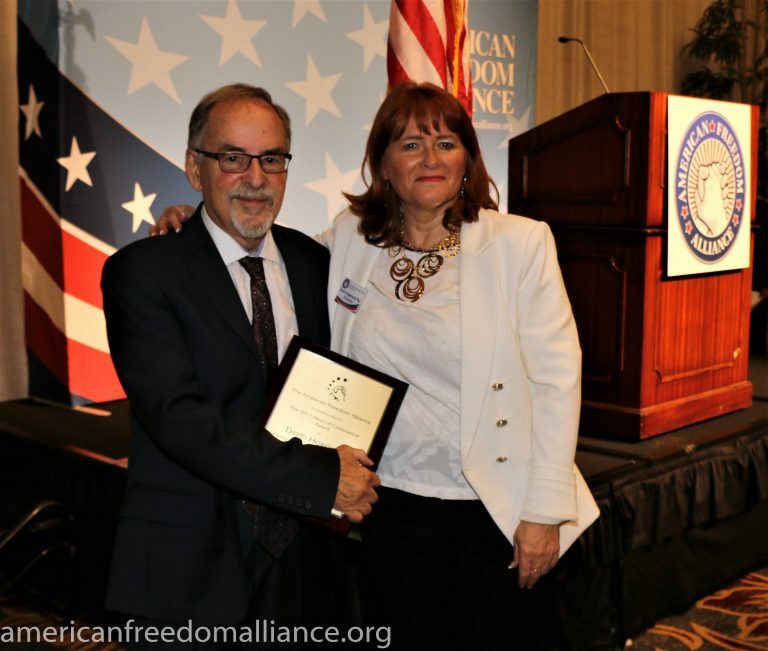 Our honoree this year, David Horowitz, is a truly worthy recipient of our annual Heroes of Conscience Award. We also created a new award this year: the American Freedom Award, inspired by the indefatigable Philip Haney, the “Homeland Security Whistleblower.” Mr. Haney’s continued work to inform Americans about the threat we face and the determination, at least by the Obama administration, to thwart all effective measures to defuse it, has come at a great cost, and we at AFA are proud to recognize and honor his selfless determination to continue to honor his oath to the Constitution. 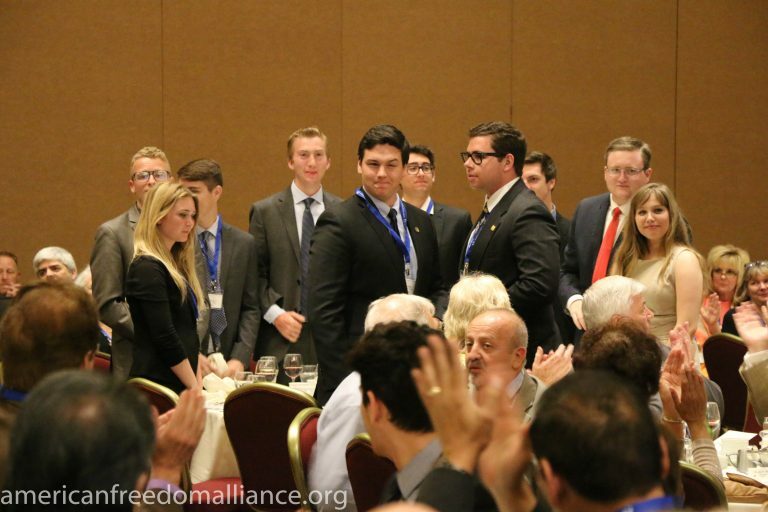 Almost 300 people gathered at the Hilton Universal City to celebrate these great men, and to come together as “allies” in the fight to preserve Western Civilization against myriad onslaughts. Our guests included at least 25 University students, about a dozen from Berkeley and the balance from UCLA, UC Santa Barbara and Cal State Channel Islands, among others. 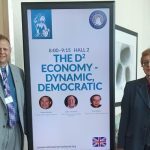 The high level of security didn’t put a damper on the excitement of the evening, and there was a constant buzz of energy and gratitude to be among like-minded people. Evan Sayet, author, comedian and political analyst, was, again, our Master of Ceremonies and Rueben Gordon was our “Sergeant at Arms.” From the opening a capella singing of the National Anthem, to the invocation by Rabbi Benzaquen, the welcome address by AFA President Dr. Karen Siegemund, through to the last bite of chocolate cake hours later, the event was a rousing success. And how refreshing, especially in the hills of Hollywood, to be at an awards ceremony where true courage, true action and true heroism are celebrated and where America and our values are treasured, rather than the self-congratulatory, faux-courage and anti-Americanism that characterize most other awards in this area. Also unlike the celebrities at those other Hollywood events, not one of our awardees set out to “become famous.” Each of them has found his way to our stage because of one passion: Doing what is possible to ensure freedom and to those values that make America, and any society, be good, strong and prosperous. 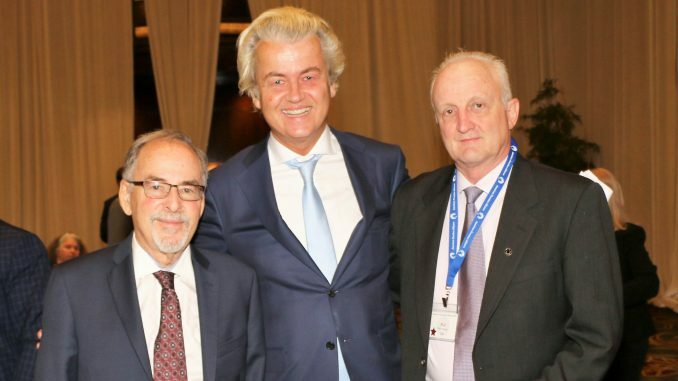 David Horowitz, Phil Haney and Geert Wilders are each committed to this fight despite the very real costs that have ensued, and any fame is a by-product of the fight, not its goal. Conversations center around their concerns, their fears, their efforts and the work that they do – mostly thankless work – to protect our freedoms and our way of life. Good, decent, gracious men all; it’s an honor to give them some small measure of the accolades that they deserve. We chose to celebrate David Horowitz for his decades-long commitment to fighting against the totalitarian left, that juggernaut which does all it can to destroy our freedoms. How do you introduce a man who requires no introduction? I doubt there are many people in this room who are unaware of David’s track record and his extraordinary contribution to the cause of Liberty in America. Each of us in this room has his or her particular reasons for rejecting the Marxist-progressive left. For some of us it is the conviction that America is as Reagan put it, a shining city upon a hill. For others it is pride in our military’s selfless acts of courage defending free peoples around the world. Evan Sayet, our M.C., calls himself a “9/13 conservative”, which is to say that he realized a day after 9/11 that yes, the left really does hate America, really does agree with Reverend Wright in his damnation of us and of our home-roosting chickens. 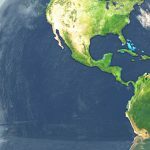 As for myself, I abandoned the Marxist leftism that I had been marinated in growing up in my hometown of Berkeley, California in the sixties and seventies when I came to understand that that ideology could not withstand critical examination under the illumination of economic principles inherited from Adam Smith, Friedrich Hayek, Milton Friedman and Thomas Sowell. But the work of David Horowitz provides the indispensable circuit-closing loop, by exposing the overarching project of the radical left, its goals, its methods, and its deep abiding hatred for America, her constitutional traditions, and her judeo-Christian heritage. We wouldn’t understand the significance of Billy Ayers of the Weather Underground mentoring Barack Obama if it weren’t for Horowitz’s interviews and insights. Decades before Black Lives Matter, Horowitz exposed the fraud of the left’s deceptive rejection of Martin Luther King Mr. and their elevation of petty street thugs and murderers like Huey Newton and the Black Panthers to the exalted status of revolutionary vanguard. It was Horowitz who exposed Tom Hayden’s deliberate violent provocation of the Chicago police at the 1968 Democratic party’s national convention. And so on and on, in countless ways, Horowitz provided us the context and the missing pieces for liberals and conservatives alike to be able to understand what was going on and to see through the lies and deceptions of those who want nothing less than the destruction of America as we know her. Only an insider could have accomplished this; it took a red diaper baby, one born into a committed activist communist family, dedicating his life’s work to the “cause” until reason and humanity overtook him, to provide to the rest of us the intimate portrait of the inner sanctums of the revolutionary left. For this we all owe him a debt of gratitude. I for one would not be quite the man that I hope I am today, if it were not for the indispensable work of this man. You can watch his tribute video here. For having the courage to turn his “second thoughts” into action, thereby becoming one of the most fearless, effective and important defenders of Freedom and of all that is good and right about America. 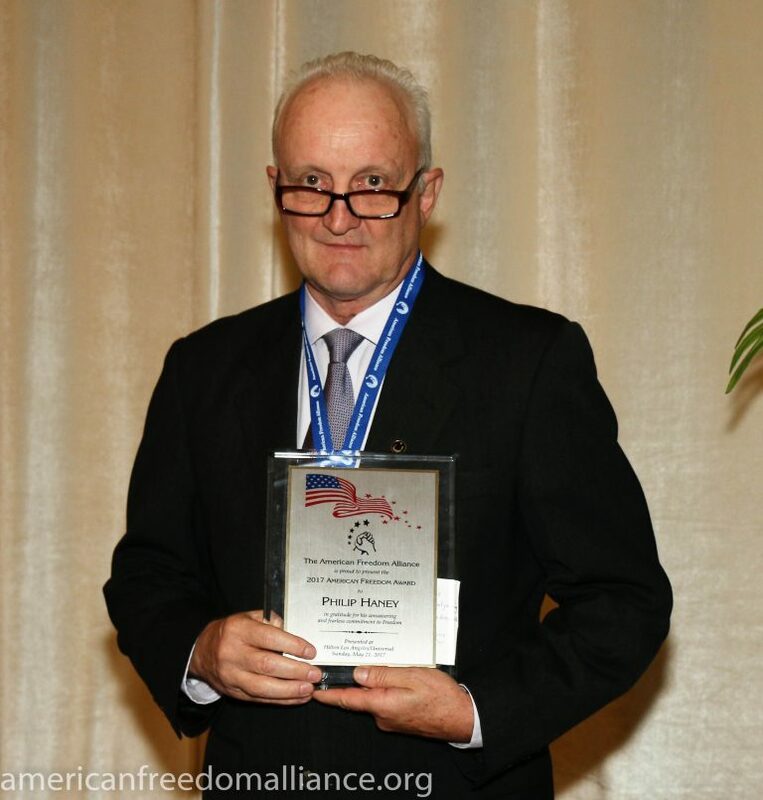 We also honored the “Department of Homeland Security Whistle blower” Phil Haney with our first ever American Freedom award for his tenacity in helping to keep us safe. Phil Haney’s work on tracking and uncovering terrorist networks was a crucial element in our national security program but, incredibly, it was not only cancelled but the database which he had helped create, that database whose implementation could have prevented numerous attacks including the one in San Bernardino, was purged. This mans’ work, in other words, could have helped prevent terrorist attacks on US soil, but the Obama administration chose, instead to coddle those who perpetrate terror rather than protect American citizens. This unassuming former entymologist epitomizes the characteristics that we applaud and honor with our inaugural American Freedom Award: determination to preserve our freedoms, even in the face of resistance from the most unlikely of quarters, in this case the U.S. Government. We were proud to give Phil Haney at least some fraction of the accolades he deserves. Our keynote speaker was the incomparable, the truly heroic Geert Wilders. He is a Dutch Member of Parliament and leader of the Party for Freedom (PVV), the second largest political party in the Netherlands. His defense of his nation’s ability and right to protect its culture and people from the various threats of Islamic Jihad has come at tremendous cost: he has lived under around-the-clock police protection for many years, and his presence necessitated security whose extent and complexity are still hard to fathom but which, especially in light of the following night’s Manchester attack, were completely warranted. 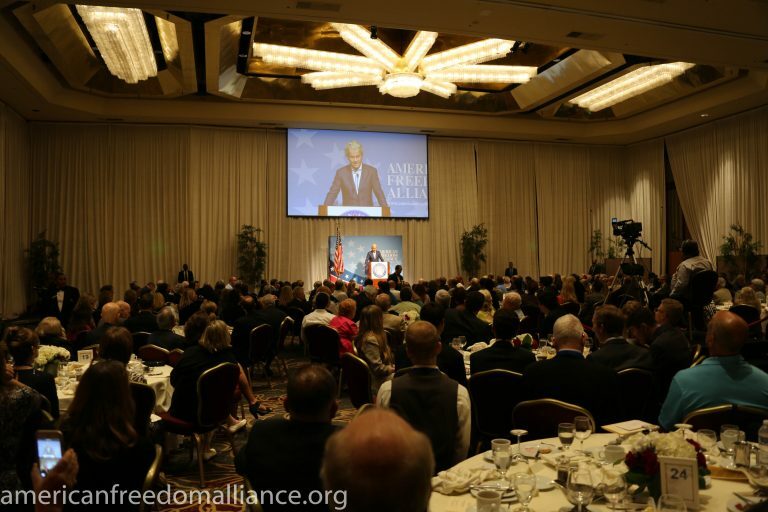 A staunch advocate for free speech and freedom in general, Mr. Wilders was the AFA Hero of Conscience honoree in 2009, and we were delighted to have him join us in honoring these two great men.